After the rousing success of the inaugural version, Kingswood Oxford School will host Girls and Women in Sports Day On Saturday, February 16. This FREE event is for girls from ages 8-14 and will be held from 9:00 am to 1:00 pm in the state-of-the-art Hoffman Field House. Participants will be able to choose from three activities that will run for 40 minutes each including volleyball, basketball, field hockey, track, strength and conditioning, yoga, lacrosse, tennis, and soccer. All skill levels, including those who have never tried a particular sport before, are encouraged to participate. The day includes a team building challenge, a lunch break, and snacks. Girls will be joined by Kingswood coaches, staff, and student-athletes, who will run small games as well as teach and practice skills. Participants and their families are invited to stay and watch the Kingswood Oxford Varsity Girls’ Basketball team, who will play against Hamden Hall beginning at 1:00 pm. During half-time at the game, there will be a shootout. 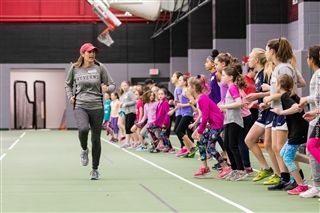 Last year, over 150 young athletes from as near as West Hartford and as far as Ellington, Andover, Tolland, and Bolton participated. This year marks the 33rd anniversary of annual National Girls & Women in Sports Day, a national observance celebrating the extraordinary achievements of women and girls in sports. The event is free but space is limited. Register by Sunday, February 8. To register visit www.kingswoodoxford.org and click on Girls in Sports Day from the homepage menu.